www.downloadslide.com 370 Part Four Organizational Processes EXHIBIT 13.3 Contrasting Mechanistic and Organic Organizational Structures (Left) © Comstock Images/Alamy RF; (Right) © Steven P. Lynch RF MECHANISTIC STRUCTURE ORGANIC STRUCTURE • Narrow span of control • High centralization • High formalization • Wide span of control • High decentralization • Low formalization prescribed behaviors even when the situation clearly calls for a customized response. 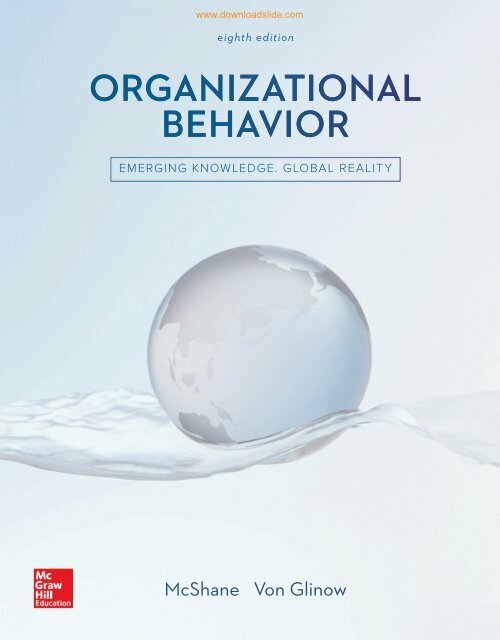 High levels of formalization tend to undermine organizational learning and creativity. Some work rules become so convoluted that organizational efficiency would decline if they were actually followed as prescribed. Formalization is also a source of job dissatisfaction and work stress. Finally, rules and procedures have been known to take on a life of their own in some organizations. They become the focus of attention rather than the organization’s ultimate objectives of producing a product or service and serving its dominant stakeholders. mechanistic structure an organizational structure with a narrow span of control and a high degree of formalization and centralization MECHANISTIC VERSUS ORGANIC STRUCTURES organic structure an organizational structure with a wide span of control, little formalization, and decentralized decision making We discussed span of control, centralization, and formalization together because they cluster around two broader organizational forms: mechanistic and organic structures (see Exhibit 13.3). 35 A mechanistic structure is characterized by a narrow span of control and high degree of formalization and centralization. Mechanistic structures have many rules and procedures, limited decision making at lower levels, tall hierarchies of people in specialized roles, and vertical rather than horizontal communication flows. Tasks are rigidly defined and are altered only when sanctioned by higher authorities. Companies with an organic structure have the opposite characteristics. They operate with a wide span of control, decentralized decision making, and little formalization. Tasks are fluid, adjusting to new situations and organizational needs. Valve Corporation, which was described at the beginning of this chapter, has a highly organic structure. With at most two layers (some claim it has one layer, and therefore no hierarchy), Valve’s span of control is about as wide as a company can get. Decision making is decentralized down to teams and individuals. “Three people at the company can ship anything,” says one of Valve’s longest-serving employees. Any employee alone can launch a product without permission, but the company encourages at least three people because “the work gets better if you just check with a couple of people before you decide to push a button.” 36 Valve also has minimal formalization. The company doesn’t have job descriptions and seems to have few lists of procedures for hiring, buying, or other activities. As a general rule, mechanistic structures operate better in stable environments because they rely on efficiency and routine behaviors. Organic structures work better in rapidly changing (i.e., dynamic) environments because they are more flexible and responsive to the changes. Organic structures are also more compatible with organizational learning and high-performance workplaces because they emphasize information sharing and an empowered workforce rather than hierarchy and status. 37 However, the effectiveness of organic structures depends on how well employees have developed their roles and expertise. 38 Without these conditions, employees are unable to coordinate effectively with each other, resulting in errors and gross inefficiencies.